The page margin settings provide control over the size of a document's page margins when printed. Use Print Preview to see a document's page margins before printing. 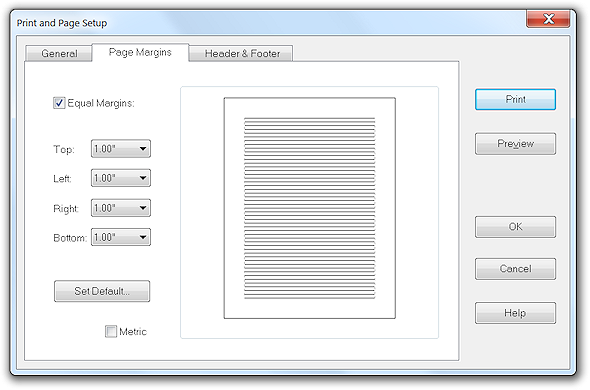 Jarte provides automatic page margin mirroring when performing double sided printing. Equal Margins: Changing any of the four margin values will change the other three margins to the same value when this setting is selected. Top: Size of the top page margin. Left: Size of the left side page margin. Right: Size of the right side page margin. Bottom: Size of the bottom page margin. Set Default: Saves the selected page margin sizes as the defaults to be used for all new documents. Metric: Determines whether the units of measure used for the page margins are expressed in centimeters or inches. This setting also affects the units of measure used for Jarte's ruler.